Origin and Habitat: Southeast Asia. Found growing in dry and moist places on the ground, on tree trunks and rocks, often on the banks of rivers that periodically flood. This moss can be allowed to float, weighed down to a gravel substrate where it will eventually attach itself, or affixed to wood or rock or wrapped around wood or rock to which it will become attached. Low to moderate for best growth. To some extent the shade of green (light to dark) depends on lighting intensity. Soft to medium hard (< 20 dGH), acidic to slightly basic (pH 5.8-7.5) water, temperature 18-29C/65-85F. It will not do well in very hard water. In warmer water, growth will be slow. This is a highly irregular moss that in its growth pattern can take the form of tree branches, long loose strands, and straight branches. Some surmise that the moss varieties known as Christmas Moss, Willow Moss, etc. may actually be variants of, or even the same as, the subject species. Propagation is by breaking off chunks and positioning them wherever you want the plant to grow. It attaches itself to object with root-like structures known as rhizoids; these do not assimilate nutrients, which occurs through the tiny leaves. Regular liquid fertilization will improve its growth. When allowed to float this plant will provide hiding places for fry and small fish. It will collect zooplankton and infusoria and be a good source of first foods for fry, invertebrates and also other fish. It is also suitable as spawning medium for egg scatterers. 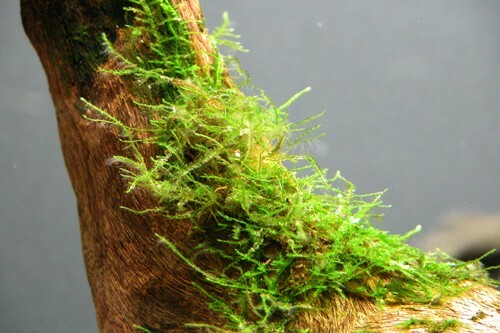 In much of the literature Java Moss is described as Vesicularia dubyana, but this scientific name actually belongs to another very similar plant known as Singapore Moss. It is the subject species, T. barbieri or Java Moss, that appears to be the most widely available in the hobby. However, common names are not official and may in fact be applicable to any of several different species depending upon who uses the name. Last edited by TFK Team; 06-02-2013 at 12:22 PM.